Scarlet Macaws are found in Central America and northern South America. They are also located on a small number of Caribbean islands including Trinidad. In these countries, they live in tropical and sub-tropical rainforests. They will build their nest high in the rainforest canopy, in the holes of hollow trees. These birds grow anywhere from 2.5 feet to 3 feet (.76 - .91m) on average. Their average weight is between 2 and 2.3 lbs (.9 - 1.04kg). It is one of the larger members of the parrot family, but not the largest. That distinction belongs to the hyacinth macaw. The scarlet macaw is one of the most beautiful parrots, and possibly one of the most beautiful animals on Earth. It has bright red plummage (feathers) on most of its body, and beautiful blue and yellow feathers on its wings. It has long red tail feathers and a large, tough beak that helps to break food open. Scarlet Macaws eat a variety of fruits, nuts and seeds. Their strong talons and long toungue are well adapted to breaking open the shells of tough nuts and seeds. 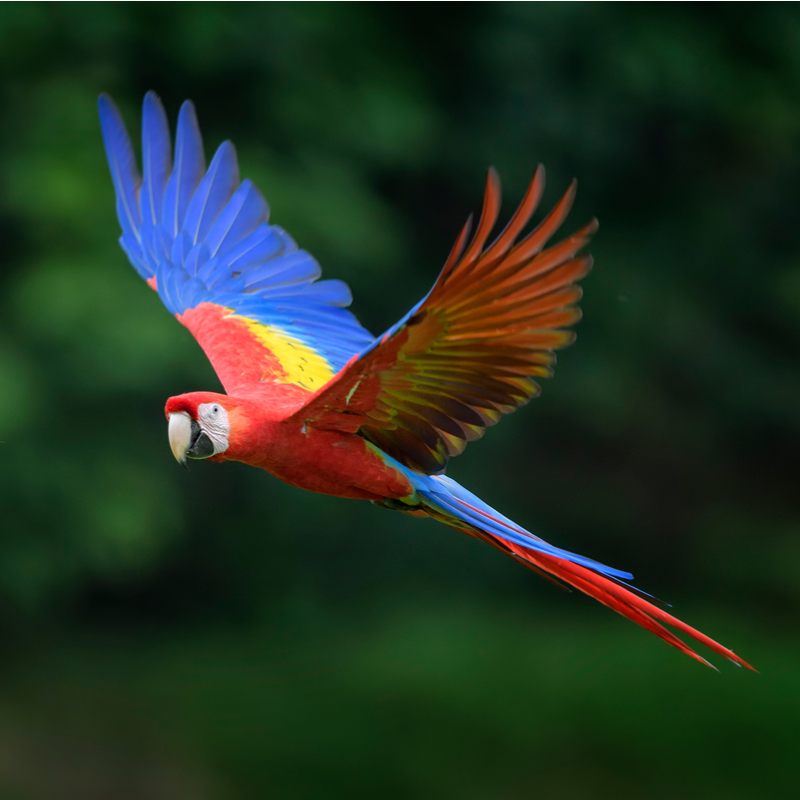 In the Amazon Rainforest, many macaws will gather on steep river banks to eat the clay located there. Some scientists believe that they perform this ritual so that the clay can help them digest toxic fruits. Other scientists think that the behavior helps supplement their diets with more sodium. Like most parrots, these birds lay 2 to 4 eggs at a time in the holes of trees. The incubation time for these eggs to hatch is approximately 25 - 35 days. These birds have a number of natural predators, including large hawks, eagles and owls, boa constrictors and jaguars.